If your opponent places his piece in the spot that is directly adjacent and diagonal to the corner and it's in the beginning or middle of the game, all you need is for any piece in that diagonal line to be your color for you to jump onto the corner. The effectiveness of a corner can, however, be diminished by the opponent's maneuvering a solid defense in against it. While a corner is undoubtedly a strong position, it is not necessarily true that gaining one or more corners assures winning the game. The squares directly adjoining the corners are also important. By taking these positions, it is possible to defeat the strength of the corners. Under most circumstances, the player who has the fewest discs is winning. As a consequence, good Othello players will often choose moves which flip as few discs as possible, preferably only one. You protect the corners by avoiding the "X" squares. These are the squares surrounding a corner. The next most important squares to control after the corners and the spaces adjacent to them are the edges of the board. The edge rows can always be used to outflank the inner rows. An unbalanced edge can be attacked by a skillful player who will give you a corner in order to take the other corner and the whole edge in between. Watch Out For The "danger Zone"
The next rows in from the four edge rows, could be considered a "danger zone", since a disc in these rows could be your opponent's bridge to a corner or an outside edge position. The darker dots on the board indicate this "danger zone". Moves that you can play but which your opponent cannot touch should be saved to the very last. Try to control the diagonals at the endgame. This will allow you to play an X square without losing the corner. In the early part of the game, avoid flipping too many pieces. This is the secret of playing better Othello. Loud moves (moves that flip many discs) allow many options to your opponent for the next move. Occupying the least amount of cells at the beginning of the game leaves you with more options and your opponents fewer selections to make. Try to stay in the center and keep your pieces surrounded by your opponents because the most important factor in the midgame of Othello is mobility. C-squares (B1, G1, A2, H2, A7, H7, B8, and G8) are located on the edges and are next to corners. Placing a disc there without any disc next to it can spell trouble for a beginner as that position can be attacked by a more skilled player. 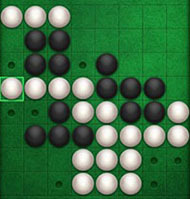 In the midgame, the main strategy is to maximize the number of available moves, while minimizing your opponent's moves. Keeping your pieces grouped together gives your opponent fewer options. Just playing the edges might run your beginner or intermediate player out of moves, but you're just playing right into the hands of the advanced player. Walls are long, unbroken lines of discs of one color sealing one side of the board. If you are forced to make a bad move late into the game, it is usually a good idea to play in an area where an odd number of empty squares are left. While the move that flips as many discs as possible may seem the most attractive, sometimes the less dramatic move is the wiser move. A solid block of one color, especially backed up against a corner or side, is often the key to winning the game. On the other hand, aggressively infiltrating into a solid block of one color can often change the tide of the game.